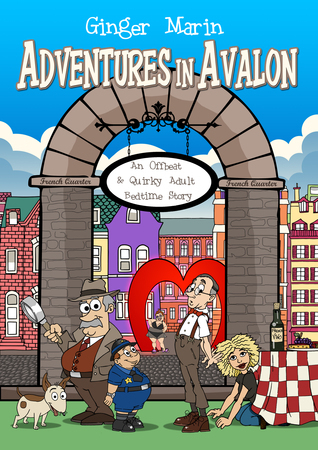 “Adventures in Avalon: An Offbeat & Quirky Adult Bedtime Story” by Ginger Marin was published in paperback on June 24, 2016. The book is also available in Kindle Format and it can be read for free via KindleUnlimited. Click the link to go straight to the Amazon sales page. Description: Intrepid reporter Ginger Marin discovers a lost civilization of cartoon people living in Middle America, in a town called Avalon in the County of Ligature-Upon-Avon … one of those quaint little communities that is somewhat lost in American space, neither here nor there but definitely somewhere. Her dispatches from the front lines will thrill and excite you as she describes all the crazy things cartoon people do when they think no one’s watching. You’ll read the fascinating, slightly raunchy, true tales of the Avalon Defense Department (a.k.a. police department) where rock star police detective General Schnitzkof, a former British officer, and his trusted assistant, rookie cop WingWing, a rotund little dumpling of a “lad”, solve some of the town’s most absurd crimes such as these: “The Case of the Missing Member or How John Sir Gwaine Bobolini Lost One of His Family Jewels and How He Recovered It … Well Sort Of”, “The Case of the Missing Haunted Mobile Home” and last, but certainly not least, “The Cream Puff Caper”, where you’ll meet some of Avalon’s worst offenders like that pervert Mr. Parabolikos and murderous old lady Wiggins. Ginger Marin is an actor-writer living in Los Angeles. For information about her acting credits, please visit Ginger’s IMDB Page. Also follow Ginger Marin on Goodreads. FREE CIA MEMOIR E-BOOK TODAY. 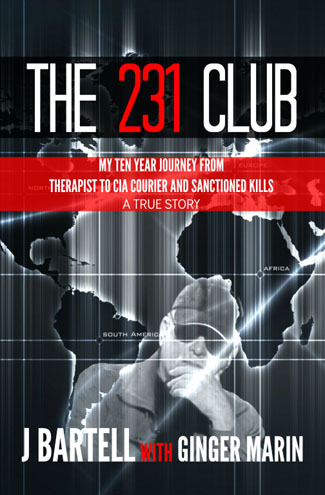 “The 231 Club: My Ten Year Journey From Therapist to CIA Courier and Sanctioned Kills – A True Story” by J Bartell with Ginger Marin. This book about CIA black ops covert operations discusses aspects of J Bartell’s life, first as a therapist, then as a courier for the CIA and beyond to covert ops. It has been well received on Amazon. We look forward to offering a free book today. If you have KindleUnlimited, it’s free everyday! TO GET YOUR FREE BOOK, JUMP ON OVER TO AMAZON. LOS ANGELES: After a successful therapist is recruited to become a courier for the CIA, his ordered world descends down a dark path leading to sanctioned kills and questioned loyalties, forever altering his concept of self and country. This is the true story of J Bartell in a newly published book by Bijou Entertainment. The 231 Club encompasses intriguing personalities, an examination of the psyche behind the storyteller, exciting and unique espionage adventures at a time when wits were at play more than gadgets. It dissects how one man with a great career and fulfilling life takes a radical detour which turns his whole world upside down. J Bartell was an instructor, lecturer and chief of staff of a large California-based therapy institute whose clients included people from all walks of life. But it was his worldwide travels on behalf of affluent clients, including heads-of-state, that put him on the radar of the CIA. What started out as simple courier work eventually lead to J Bartell becoming part of a small group that handled off-book assignments, meaning no record, so there’s plausible deniability. The group, an extension of the CIA’s black ops division referred to as Executive Action which was created in the 1950s, consisted of Bartell, his CIA handler Chauncey Holt and former U.S. Marine, Michael Harries, best known for having created the famous Harries Flashlight Technique used by law enforcement around the world for handling arms in low-light conditions. What’s interesting about J Bartell’s decision to move forward was how he explored his options and even thought about the importance of the work and how it could possibly affect people’s lives if he didn’t act to help rid the world of “bad guys”. As a result of his increased involvement, Bartell experienced everything from weapons deals and covert training missions to helping ruthless killers, hiding behind positions of power, get their due. On the subject of his black ops assignments, J was previously interviewed by award winning investigative reporter Judd McIlvain, a winner of eight golden mike awards and two Emmy Awards and award winning investigative journalist/crime reporter Peter R. de Vries of the Netherlands. The significance of the book’s title is that once J Bartell becomes truly engaged in black ops, his handler Chauncey Holt welcomed him into The 231 Club — 231 being the name of the gun powder for their weapon of choice, the 45 caliber Colt 1911. Watch video interviews by author J Bartell by visiting his YouTube Channel. Drawing attention to my movie reviews archive site LOTTA REVIEWS where I’ve picked up writing reviews again for some select films. Recent reviews include the beautifully written The Words with Bradley Cooper, Dennis Quaid and Jeremy Irons; Words and Pictures with the fabulous Clive Owen and Juliette Binoche; Nightcrawler well done with Jake Gyllenhaal; The Theory of Everything with the astounding Eddie Redmayne (must see! ), The Judge, a terrific drama with Robert Downey Jr and Robert Duvall; Edge of Tomorrow a terrific action film with Tom Cruise and Emily Blunt, The Rover a good character study starring the inimitable Guy Pearce with Robert Pattinson; Gone Girl with Ben Affleck and Rosamund Pike. Please have a look around the site. By Ginger Marin. To learn about her acting, visit Ginger Marin’s IMDB page.